Retail $26.99 SAVE 23% ! Not that hard a build for a level 3. I actually bought a second one, I liked it so well. I would agree with other reviewers that the paint job is the most difficult part of the build, but you can make it as difficult (or not) as you want. Very sturdy- I have had two parachute-related crashes with my first. On the first crash, one of the three parachute suspension lines ripped through the chute. The rocket fell onto a light in a parking lot before landing on the concrete, and had a fin break loose. The second crash was (I think) caused by using too little recovery wadding, which made the parachute melt slightly and stick to itself. No major damage, even though the chute did not deploy at all. Looks great on the launch pad, and the D engines sound great. The design of the v2 is one of the most iconic rockets in rocketry. The bubble shape can be found in almost any rocketry related thing from forming headliners piggy banks comic books and everything in between. I highly recommend this rocket to EVERYONE. With the cost of the Estes V2 it really makes it an affordable rocket for any rocketeer. The nice thing about this rocket is it isn&apos;t small at all. It has a fairly large airframe and a nice bulky nose and tail cones. 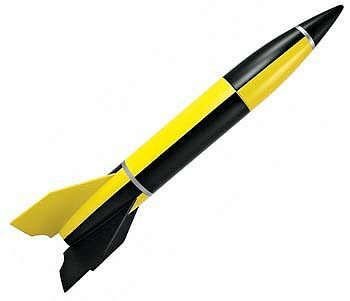 A couple tips when building this rocket; use kevlar to anchor to the motor mount then a shock cord drill too holes on the bottom of the nose cone to loop another piece of kevlar and use elastic in between the too. This will save the nose cone anchor point from snapping on ejection and also will be stronger then the elastic mated to the MMT. If using epoxy to do the fin fillets use some masking tape around the fins to help keep it even. peel away masking tape after a couple minutes (before hardening starts)and it will leave you a nice clean fillet. This rocket has nice low and slow flights. Great for flying on smaller fields. To me, the Estes V2 is the best rocket kit ever made. It has a great history so you can paint it like the developmental black/white test pattern, or the camouflage pattern, or, of course, any way you like. It is relatively easy to build and is very durable. The fins go through the main plastic body and glue into the inner engine tube so there are two places to glue. This makes the fins very rigid and nearly indestructible. The one down side is that it is heavy but there are lots of options in engines to give it power. My favorite is the E9-8! Lots of blast on the pad and straight and high flight. This rocket is also well suited for a mini key chain video camera (see my pictures). The large tube and large mass makes the added camera weight a non-issue. "Scale project at a sport price!" I have just un-boxed my V-2 and I am excited by the possibilities! I originally intended to do my usual - sort of follow the directions, upgrade to a larger motor mount, etc. but now that I see the unusually detailed fin area and the other cool details I have decided to try a scale project. The stock paint job is cool but searching online reveals a ton of options for cool finishes. I am looking forward to building this bad boy!